08 Jun 2018 --- Israeli-based start-up, Wine Water Ltd., is set to launch O.Vine, the world's first non-alcoholic spring water infusion with the spirit of wine. According to the company, O.Vine brings an intoxicating aroma and refreshing taste to the palette. O.Vine is shaping a new water category inspired by the world’s two oldest beverages: water and wine. 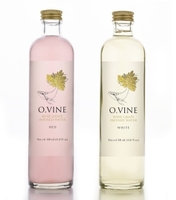 Combining the benefits of healthful extracts such as wine grape skins and seeds with pure spring water, O.Vine is an all-natural, non-alcoholic beverage without preservatives or added colors. Its color and ingredients are derived from red or white wine grape waste. O.Vine was conceived in collaboration with award-winning Practical Innovation, Israel. The team succeeded in developing clean, controlled process to prevent oxidation, all while maintaining the wine’s appealing natural color and aroma. The O.Vine line features two still beverages and two carbonated drinks, which are available in red varieties (from cabernet, merlot, syrah and petit verdot) and white varieties (from Riesling and gewürztraminer). The new line will be launched at the Summer Fancy Food Show in New York, June 30-July 2, 2018.